Where is the best early season skiing for families? Ski fever is highly contagious, especially among eager skiing families. The symptoms start mid-October, as cold weather descends. Ski equipment comes out of storage. If your kids begin wearing their ski jackets to school before warranted, that’s another alpine indicator. Our family gets pumped for fall line fun at the first hint of frost. Actually, my son keeps his skis in his room all summer, on display in an alpine shrine. If your gang is like mine, and can’t wait for the calendar to proclaim winter, there are several New England ski resorts who flex their snowmaking power in October in the battle for first ski resort in the East to open for skiing. Warning those early season ski days in the fall usually mean skiing on very limited terrain, sometimes just a ribbon of snow on advanced upper mountain slopes. Given the low trail count and sketchy snow conditions, this is not the best time to bring your young skiers out, particularly if they are still beginning or intermediate in their skills. The slopes can resemble a human slalom, too many zealots on too few acres. You are best off to wait until several trails and a few feet of coverage are being reported to take the kids out. In the annual rush to drop the first ropes, Sunday River and Killington come to mind. Killington blankets Killington Peak area with snow first and foremost, catering to expert skiers (read: diehards) on Vermont’s highest lift served terrain at 4,241′. Sunday River and The Big K, K-Mart or Beast of the East both open Friday Oct 19, 2018 for the tie, typically first in New England. Sunday River is legendary when it comes to snowmaking, with 2,000 snow guns, they often tie with Killington for opening day, typically before Halloween, sometimes with free skiing with a costume! Our family has enjoyed phenomenal November skiing at The River on deep manmade base depths. Once Locke, Barker and South Ridge at Sunday River are open, that’s a good time to hit this Maine resort. Okemo has never failed us for early season ski weekends. The Vermont resort is far quieter in pre-holiday December, and their manmade blizzard is impressive. Okemo blasts outsnow with a goal of opening terrain for all abilities in the early season , and the majority of their terrain by the holiday week. Once you see The Sunburst Six chair and Jackson Gore open at Okemo, you know they have worthy snow. Loon Mountain in New Hampshire, since becoming a Boyne Resort, like Sunday River and Sugarloaf, has entered the big snowmaking game in the East. 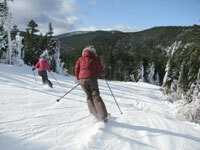 With lots of low-E snow guns, Loon blows tons of snow to open early and stay open latest in NH. Sugarloaf has a northern Maine location, elevation, and typically cold temperatures – allowing it to open most seasons by mid to late November. Snowmaking at the Loaf has been ramped up, doubled in fact since Boyne was brought in. When Mother Nature lends her hand, the Loaf can be in good ski shape for early season skiing. 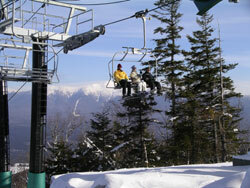 In New Hampshire, Bretton Woods makes tons of snow and offers the most terrain in the Granite State. Bretton Woods typically makes a plan of opening by Thanksgiving weekend, with a goal of spinning the Learning Center Quad and the Bethlehem Express Quad with enough green circles on their gently sloped front side to placate moms and pops with tots. Keep an eye to the forecast for chilly weather and check the daily snow conditions, and our ski blog, to find the best snow for your family. For the best Eastern skiing for families, ski resorts need cold temps and a boost of natural snow. Getting the family out on the slopes prior to the busy holiday (and before peak pricing) is a great way to get everyone’s ski legs in shape before the big winter snow arrives (more wishful thinking here). A day trip to the mountains or a ski weekend in early December is a better way to celebrate the turn of the season than hectic holiday shopping in the crowded materialistic malls.